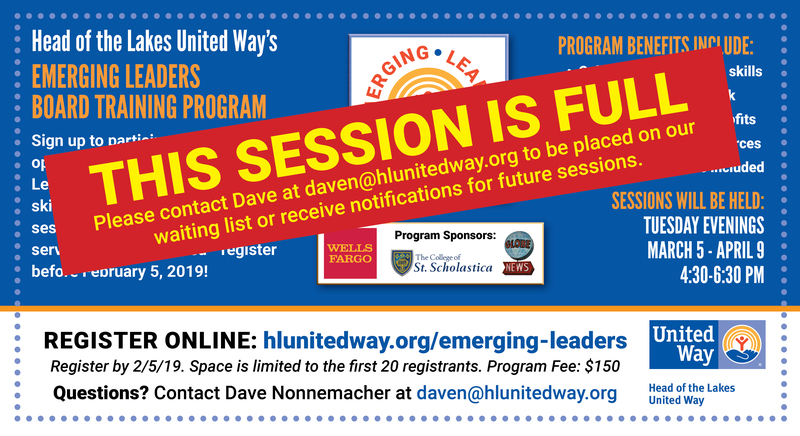 Head of the Lakes United Way (HLUW) Emerging Leaders program is a comprehensive training program for individuals who are interested in serving on nonprofit boards across the Twin Ports. It’s an exciting opportunity for professionals to leverage their leadership skills through volunteerism and gain an understanding for what it takes to become successful board members. The board training program is a 6 session series. Training sessions include topics such as board engagement overview, nonprofit board structures and responsibilities, nonprofit legal issues, and lastly, balancing volunteerism and professional obligations. The fifth training session will be a speed board match event, where participants will have the opportunity to meet local nonprofits that are seeking board or committee members. The final session will be a special graduation celebration. • Complete a board service training program that will equip you with skills to be successful on a board. • Opportunities to strengthen your network by connecting with area professionals. • Gain a deeper understanding of a variety of health and human service agencies in the area. • Head of the Lakes United Way will serve as a resource while members are seeking board opportunities.